In the previous issue, having fought his way through the United States military, Aquaman finds himself face to face with Superman. Needing to get back to Atlantis to defuse the situation, Aquaman refused to surrender to the United States government, and a brawl ensued. Aquaman manages to hold his own in the losing battle, with help from Mera, but it quickly becomes obvious that this is not a fight he can win. As the conflict continues, Aquaman laments his role in the Justice League, seeing himself as an outsider not only amongst the Humans and Atlanteans, but also among his own friends. The battle concludes with the arrival of the full Atlantean armada, ready to attack at the word of their king. Aquaman tells them to stand down and finally manages to retreat into the water, Superman threatening that he had better fix this. 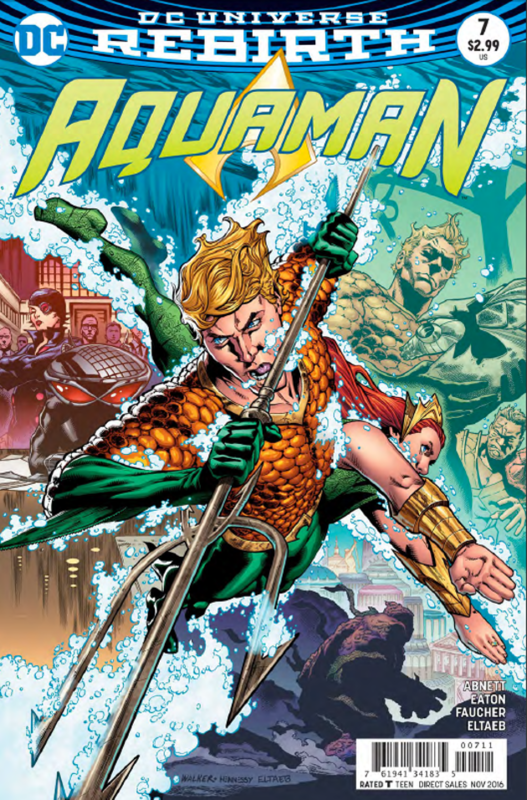 This issue picks up a short while later, with Aquaman having barricaded himself in his room to think away from the constant interruptions from his advisers. Insisting that he need to deal with the problems before they build into something greater, Mera begins to let them in one at a time. Most notable among these are two advisers in particular, one urging him to have Mera perform the proper ceremonies to become worthy of marrying an Atlantean king (which angers Arthur at the mere mention of Mera's worth), and Murk, giving a report on their investigation into the sunken submarine, complete with evidence that they were set up by surface dwellers. Aquaman goes to see the leader of the Deluge to determine if he was involved, but he denies any knowledge. Back with Black Manta, he determines that the best time for N.E.M.O. to attack Atlantis would be now, while they are in disarray, unleashing a monster underwater and sending it towards Arthur's home. I thought that this issue was a good change of pace from the previous few, going back to much more political issues and planning rather than simply action, which I had my fill for a little while with previously. The artwork has improved a bit from previous issues, I feel, although occasionally faces continue to make odd expressions. A lot of this increase, I feel, is due to the much needed shift from land to sea, allowing for much more interesting and exotic backgrounds, as well as the ability to fill up unused space on the page with colourful fish. Additionally, it becomes much easier to show motion, due to the use of motion bubbles, creating a more dynamic environment of action and bustle. Ultimately, I enjoyed this issue even if it wasn't necessarily anything amazing. It was nice to get away from a lot of the constant action that was plaguing the title in the past few issues and getting back to what I personally am more interested in, a king trying to figure out the best course of action for not only his own kingdom, but the surface world that he also loves. It looks like some of this may be stripped away a bit in the next issue due to Black Manta, but I've enjoyed what I've read here and hope the future of the series contains much more politics to balance the super heroics.